BROOMFIELD, Colo.–Spatial Corp. is incorporating 3D mesh technology from Distene S.A.S. 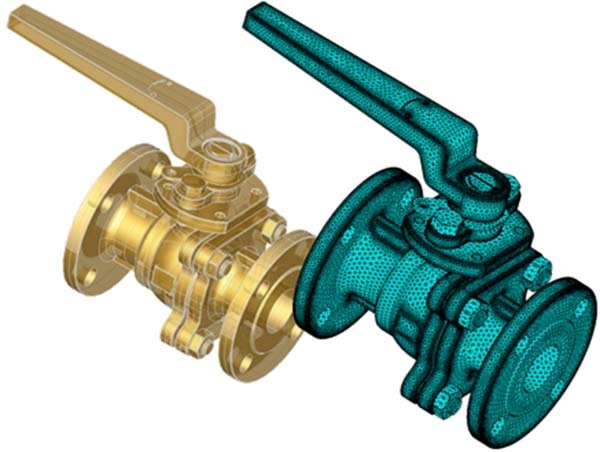 into its 3D modeling software development toolkits (SDKs) to improve the CAD to solver process for analysis and simulation, the company announced recently. Spatial, a subsidiary of Dassault Systèmes, provides 3D software development toolkits for design, manufacturing, and engineering applications across multiple industries. The improved product, 3D Precise Mesh, not only accelerates time to market, but also automates the process while improving the overall quality of the resulting generative design, Spatial Corp. said in a press release. Through this partnership, Spatial extends its current mesh offering of 3D Mesh with 3D Precise Mesh, which is reported to bridge the gap between CAD and simulation/analysis. In the past, end users have resorted to iterative meshing, analysis, and design processes that can take weeks to complete. "We were looking for a lightweight meshing component to be used in all our finite-element-solvers and decided on components from Distene," said Oleg Skipa, of Dassault Systèmes, in the release. "Their Tetrahedral meshing technology represents the de facto industry standard. We also use Spatial's 3D ACIS Modeler for our 3D geometry kernel. Crucially, these two technologies interface extremely well. Spatial can leverage this mesh technology and provide an integrated solution for customers." The self-contained meshing component can be easily integrated into a software application, providing end users with access to a solution that can be validated via a large and growing database of models. With support for parallelized meshing, 3D Precise Mesh removes the limits for the world's most demanding simulations, Spatial said in the press release. "The CAD to solver link has long been a bottleneck in the 3D modeling world that Distene aims at reducing with automatic and industrial-strength meshing technologies," said Laurent Anné, sales director and co-founder of Distene, in the release. "This partnership leverages the technological heritage of both Spatial and Distene to provide analysis applications with an efficient CAD to solver link that is fast, flexible, and most importantly, delivers the best mesh available for critical simulation workflows." "Our customers are realizing incredible results through simulation and analysis of 3D models, delivering the applications that empower designers to create superior products, sooner, at lower costs," added Brian Rohde, Spatial's senior product manager responsible for 3D modeling. "These analysis workflows necessitate surface and volume meshes that are precise, fast and crafted to optimize the solver's numerical analysis results. Through this partnership, our CGM Core Modeler and 3D ACIS Modeler customers can deliver best-in-class meshing solutions to their end users today. Because of our expertise in 3D modeling and this collaboration with Distene, we look forward to helping our customers continue evolving their applications with 3D Precise Mesh."